Are you wondering if this thing is for real? 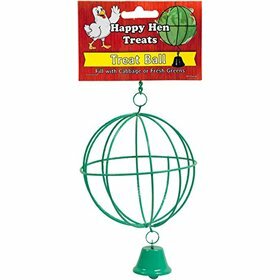 We wondered the same thing, incredulous that chickens could actually enjoy swinging. We thought it was just a glorified roosting pole. We're happy to say that we were wrong! 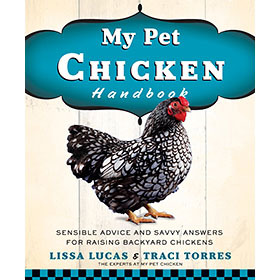 This thing is a revelation: chickens seem to love it. Take a look at the video below and decide for yourself! And here is a video of baby chicks enjoying their swing! 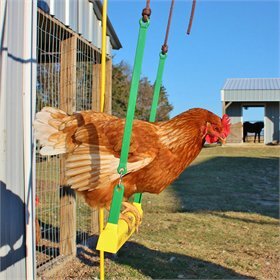 If your flock spends most of its time outdoors, free ranging, they probably won't make much use of this swing. As cool as it is, dust bathing and hunting for bugs, weeds and worms is more compelling to them. 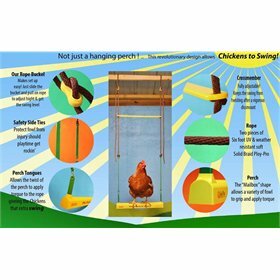 If, however, your birds spend time in confinement, The Chicken Swing can be a helpful tool in your boredom-busting toolbox. As seasoned chicken keepers know, distractions and diversions are especially important for confined birds, who tend to peck at and harass one another when bored. This 17.75" x7.8" x 2" swing comes fully assembled to make for an easy, quick set up. Rope is 16.26' long to allow for a wide variety of coop and run set-ups. Never force a chicken to use the swing. They'll try it out when they're ready. 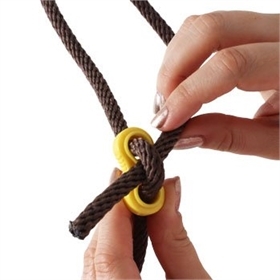 Once the swing ropes are in position, loop them through the rope buckle (yellow clips at the top of the swing in the second picture, above) by pulling to tighten. The swing perch itself should sit fairly square and level. You may alter the height of each side by pulling the rope through the rope buckle. 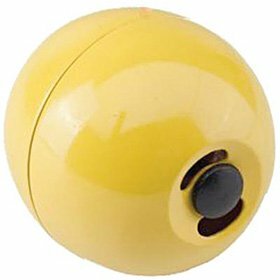 There are several safety features, too, to make sure your chooks stay safe while they play--see the last image in the line-up above.